China and Russia are aggressively developing capabilities such as anti-satellite (ASAT) weapons that could soon destroy all U.S. satellites in low-earth orbit, according to a new report issued by the Pentagon’s Joint Staff. ASAT weapons could decapitate the Pentagon’s use of surveillance, navigation, and communications satellites from its arsenal during wartime efforts, which would severely cripple the effectiveness of U.S. armed forces. The Joint Staff intelligence directorate, known as J-2, published the warning in a recent report on the growing threat of anti-satellite (ASAT) weapons from China and Russia, according to The Washington Free Beacon. Officials who were familiar with the report stated, “China and Russia will be capable of severely disrupting or destroying U.S. satellites in low-earth orbit” in the next two years. Back in May, the Director of National Intelligence Dan Coats issued a very similar warning but less specific than the J-2 report. Coats said that both China and Russia are colluding with each other to limit U.S. defenses in space through collaboration and the development of ASAT weapons. Russia’s arsenal of space weapons include a “diverse suite of capabilities to affect satellites in all orbital regimes,” Coats testified to Congress, including a non-kinetic means of targeting U.S. satellites through direct energy weapons. “Ten years after China intercepted one of its own satellites in low-earth orbit, its ground-launched ASAT missiles might be nearing operational service within the PLA,” Coats said. Space expert Michael J. Listner said ASAT weapons were developed in the Cold War days. Both the United States and the Soviet Union acquired the technology many decades ago that could knock out each other’s satellites in space. “The United States ASAT program, Program 437, took the form of the ASM-135 missile, or the ‘flying tomato can’ and was intended by the Reagan administration to be a deterrent to the Soviet co-orbital system,” said Listner, founder of Space Law & Policy Solutions, a consulting firm. “When Congress defunded development of the ASM-135 there was no follow-on program to provide the desired deterrent effect,” Listner said. “Russia did not completely scrap its program and China is pursuing its own, leaves the United States with the conundrum of how to deter the threat aside from the hope of resilience,” he added. The Washington Free Beacon notes that the Pentagon’s low-earth satellites are highly vulnerable to Chinese or Russian ASAT weapons. “This vulnerable communications and data collection, processing, and distribution infrastructure is worth billions of dollars and is vital to nearly every activity of the United States and, increasingly, the armed forces of U.S. allies,” he stated. Last week, the Pentagon launched its largest-ever three-week premier set of air war drills, called Red Flag 18-1, which started last Friday and will conclude February 16. Right now, the Pentagon is blacking out GPS over the Nevada Test and Training Range, which provides realistic war-like conditions to challenge fighter pilots. To sum up, the Pentagon is preparing for the next global conflict which could start in outer space. 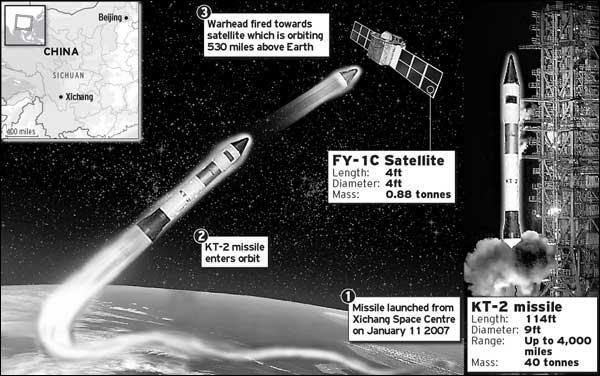 As highlighted by the Pentagon’s Joint Staff, China and Russia’s ambitions to knock U.S. military satellites out of low earth orbit have certainly spooked Washington. If China or Russia deploy an ASAT weapon and take out critical satellites of the U.S. military, it could render the Pentagon blind. This is no position any country wants to be in, and now we understand why the Pentagon is currently conducting massive air war drills in Nevada with simulated GPS blackouts.